Front of purse with flap down. First let me thank everyone for their condolences. The wake and the service and the whole thing really turned out just perfect. I said the Lords Prayer and went with the flow and everyone worked out the details just fine. What a powerful prayer. It is over now...at least the uncomfortable part. Now all we need to do is take good care of my mom. In the meantime I've been working on painting purses. I used some images that I purchased from Tracee Moore and some of my own. The one on the back is an ink block print I did. 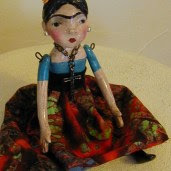 I love Frida as you might guess from the number of dolls I've made of her. I have some more dolls of her coming on ebay soon. I'm not sure if I will sell the purses or not. Why do I always get that way? I guess because its therapy for me. When I paint and create it's for my own personal growth and then to sell it is like its that part going away. Anyway, I must get back to working for ebay and doing some business stuff or I'll late for the Christmas rush. I am going to open an ebay store and then after Christmas work on the Yahoo Store and website. Now there will be another responsibility of caring more for my mother and she is in another city. Not far but, I have shared custody of one of my granddaughters and I must pick her up every other week as well. Unfortunately they both are in opposite directions. Time to say the LOrds Prayer again. Just read about Bernie, your mom, your grandchild, etc.. I wanted you to know that I said a prayer for all of you.